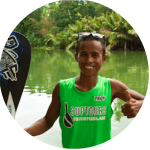 Meet the SUP Tours Philippines’ Team! Born and raised in Manila but found herself more at home now in Bohol. A Level 1 SUP Enclosed Flat Water, Level 2 SUP Exposed Waters SUP Instructor and SUP Yoga Instructor under ASI (Academy of Surfing Instructors) and a certified Yoga Teacher of the classical yoga tradition with Sivananda Yoga Vedanta (Yoga Alliance 200hr RYS.) She devotes her time in practicing yoga, traveling, surfing, paddleboarding and mountainbiking whenever she can. 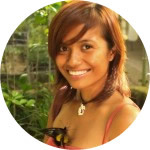 She founded Pure Prana Yoga, dedicated for regular SUPYoga classes and retreats at SUP Tours Philippines. Born at the Belgian coast, his passion has always been doing and teaching watersports. 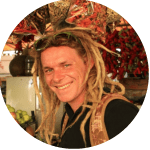 He is a kitesurf school manager in Belgium, an IKO (International Kiteboarding Organization) Certified Level 2 Senior Kiteboard Instructor and Level 1 Enclosed Flat Water and Level 2 Exposed Waters ASI (Academy of Surfing Instructors) Certified SUP Instructor. Also a local from Valladolid Village in Loboc, your tour experience will be as authentic as Boholano hospitality can be. 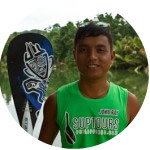 A great guide with good communication skills, he can give good inside tips about Bohol in general and the local lifestyle. Your safety is his number one priority. John Ray is a Level 1 and Level 2 ASI (Academy of Surfing Instructors) Certified SUP Instructor. A resident of the neighboring village of Valladolid and a true Lobocano, she has previous experience as an overseas worker. Her home-style cooking is the embodiment of an authentic Boholano cuisine. 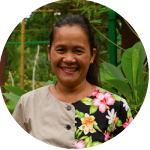 She will make you savor the best of Bohol dishes with fresh-from-our-garden ingredients.